Indianapolis agreed to terms with Andre Johnson yesterday, adding the WR to a sizable and significant free-agency haul that figures to upgrade the Colts at multiple positions on both sides of the ball. Every year or two, one team decides that its window is as open as it's ever going to be, and makes the short-term deals with veterans that it believes will put it over the top. It's the Colts' time now. But Johnson will only be asked to be a piece of the Colts varied passing attack, something that bodes well for the effectiveness and durability of the big, physical, tough-MF receiver. T.Y. Hilton is the clear number one guy, but Andrew Luck loves his tight ends, and loves to spread the ball around—Johnson's 2014 stats, a slip from previous seasons, would still have made him the second most prolific receiver in Indianapolis. Even if Johnson doesn't work out, the Colts are shotgun-spraying free agency. In just the first 24 hours, they've also added Frank Gore to be the every-down back they haven't had since early Joseph Addai; versatile O-lineman Todd Herremans who will start at right guard and clear the way for Gore, but who can also play at tackle and on either side; LB Trent Cole to reinforce a disappointing pass rush; and D-lineman Kendall Langford to help stop the run. They also re-signed safety Mike Adams, a scrap-heap pickup who turned into a Pro Bowler. None of these players are game-changers on their own, but they should be steps up from what the Colts currently have. Indianapolis is a very good team that's able to get better, a rare luxury in this league, and one afforded them almost solely by the existence of Andrew Luck. The biggest advantage a team can give itself in the salary-capped NFL is to draft a great quarterback, and be good while he's still young (easy, I know.) Look at the cap situations of the Saints or Bears or Giants, and see how immediately hamstrung they are the need to lock up their quarterbacks. (It is possible to overcome this handicap, like the Patriots and Packers have, through a combination of good personnel moves and creative cap work. But it's tough.) It's only because Andrew Luck is still on his rookie deal that the Colts have the space to add multiple major pieces around him. It's all about windows. Luck won't be affordable for long—he's in line for a massive contract that one pundit mused could be the richest in the NFL. The time to spend is now. And the windows of the Colts' crop of veteran signings are in play, too: the trick is to land them before they drop off altogether, but after they can be had at bargain prices. That latter, at least, can also be partially attributed to Andrew Luck. What player, especially on offense, wouldn't want to come play in Indianapolis right now? Even, perhaps, if it means taking less money. 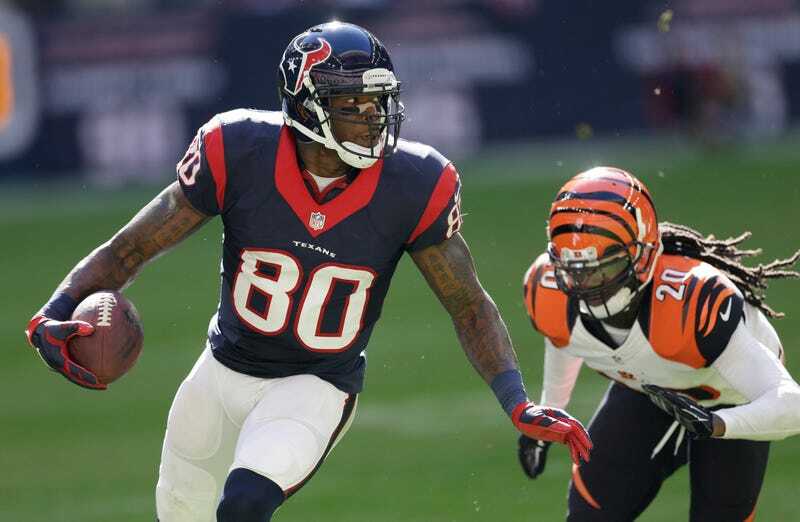 "After I got released by the Texans, Frank [Gore] called me," Andre Johnson said. "He called me right after it happened and was just like, 'What are you gonna do?' I'm like, 'Frank, I don't know. I just got released. I don't know.' I asked, him 'Who do you think has the best chance to win a Super Bowl?' And he was like, 'Indy.' And I was like, 'That's my same choice too so let's do it, let's go for it.'" Andrew Luck is the best of his generation of quarterbacks, and figures to be a superstar for another decade. But nothing is assured in this league, not even year-to-year. So when a team comes within a game of the Super Bowl, they'd be foolish not to go for it. Few teams are better equipped with the talent and the flexibility to even attempt the next leap; whether the Colts will successfully complete that leap is another question altogether.